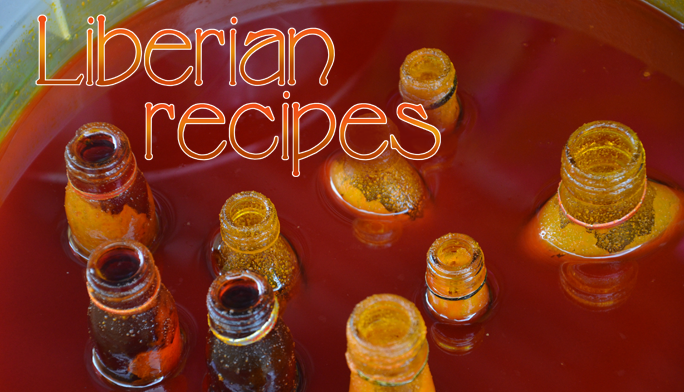 Almost every Liberian recipe includes red palm oil. You can buy it in the marketplace by the gin bottle as seen above. If you don't need that much, you can also buy it in little plastic bags about the size of an egg. I personally can't comprehend who would buy so little because I never saw anyone ever use it sparingly. When the oil is warm, it is that deep orange color. As it cools, it turns that yellow-orange which probably clogs the arteries of everyone who enjoys it. I've collected several Liberian Recipes during my Peace Corps stay in Zwedru as well as in my return trip with murals and the U.S. Embassy. It's long overdue to make them easily accessible in one location.